Snap beans come in a huge range of sizes and colors, because any immature bean with pods that taste good when “snapped” into pieces is a snap bean. They are classified into two major groups, "bush" beans and "pole" beans. These are called green beans, snap beans, wax beans, butter beans and many more local and regional names. Bush beans are short plants, growing to approximately 2 feet in height, without requiring supports. They generally reach maturity and produce all of their fruit in a relatively short period of time, then stop producing. 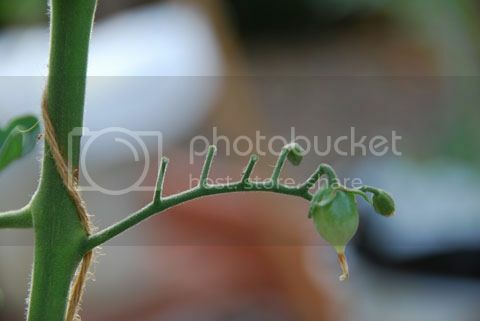 Pole beans have a climbing habit and produce a twisting vine, which must be supported by trellises or cages. Both purple and yellow wax beans are snap beans with color variations. Purple beans are a bush variety, their color comes from plant pigments called anthocyanins. Anthocyanins are water-soluble pigments that also give red cabbage, purple cauliflower, and purple asparagus their vibrant color. You will notice that they turn green when steamed or boiled. Yellow wax beans are common in bean salads and have a very crisp and waxy bite that is particular to the yellow variety. The Tale of the Three Beans ends with this….all three are beautiful to look at, all three are delicious and all three are easy to grow and thrive at Marymoor. Try all three and decide for yourself which one you like the best. Pineapple Tomatillo or Ground Cherry? I was at the Master Gardener Plant Sale this May and purchased a plant I had never seen before called a pineapple tomatillo. I looked it up on the internet before I bought it and was intrigued by the description. This plant grows like a tomatillo only it has a denser habit and tastes like pineapple! I am a sucker for anything tropical tasting so I took the plant home with me, hardened it off and planted it at the garden when the danger of frost passed. It is growing well with tiny husks the size of nickles and fruit inside those husks the size of blueberries. It takes regular water and is not bothered by many pests at tall. When the husks turn a golden brown they are ready to be picked. I noticed these tiny fruit tend to drop off the plant as they ripen, the fallen fruit are perfectly ripe and should not be discarded. As I was munching on the fruit and doing research for this post, I ran across several articles that label this plant as a ground cherry. I am not sure what I have grown but it is delicious and does taste like pineapple, not many of them make it home as I tend to eat them out of hand as I pick them. I took a look at some local weather history last night and it seems June 2015 has shattered local heat records and lack of rainfall records. So far, it has been an amazing summer for vegetable gardening at MCGA. The heat has produced a bumper crop of everything in our garden: cucumbers, beets, beans, peas, broccoli, lettuce and greens, cauliflower just to name a few. With all the continued heat, hopefully the PNW won’t be headed into the realm of enforced water restrictions this summer. Plants are over 90% water. There are critical periods in which lack of water has an adverse effect on your vegetable crops. Some of these effects can be mitigated if you can target the timing and amount of water to add. As a rule of thumb, water is most critical during seed germination, the first few weeks of development, immediately after transplanting (try to fill your planting hole up with water before you put your transplants in and try not to plant or move crops in full sun), and during flowering and fruit production. Cole crops (broccoli, cabbage, cauliflower, collards, Brussels sprouts, kale, and kohlrabi) need moisture during their entire life span. This is probably one of the most sensitive plant families when it comes to needing consistent watering. Water use is highest and most critical during head development, if consistent water is not given, the plant will be stunted, be very prone to aphid attack, the heads may not form or be very small and/or bolt and flower right away. Beans have the highest water use of any common garden vegetable. During blossoming and fruit development, beans use one-quarter to over one-half inch of water per day. I plant my beans very densely so they can shade one another. 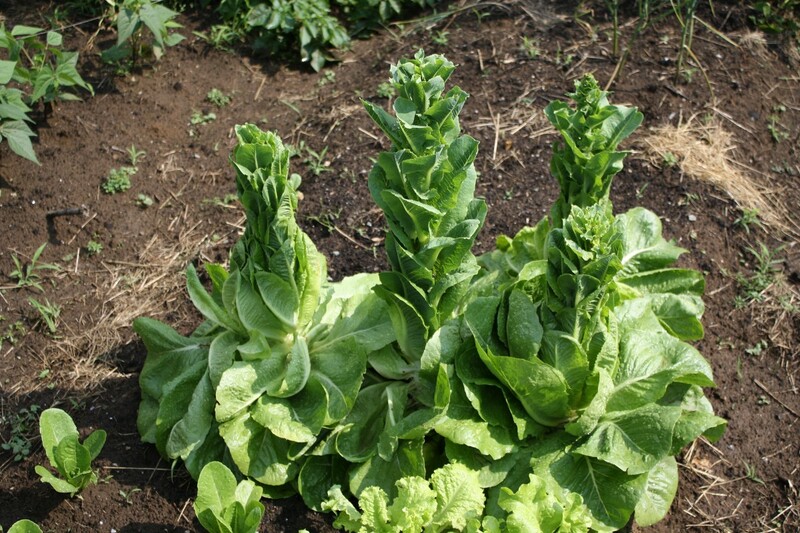 Lettuce and other leaf vegetables need water most critically during head (leaf) development. For quality produce, these crops require a constant supply of moisture. If not the greens can become bitter, stringy and they may bolt prematurely. Onion family crops, (garlic, leeks) require consistent moisture and frequent irrigation due to their small, inefficient root system. They often fall over because to weak roots, it is best to pull them if this happens. Potatoes tubers will be knobby if they become overly dry during tuber development. Potato scab is a common problem when there is insufficient moisture during tuber formation. Tomato family (tomatoes, peppers, and eggplant) needs water most critically during flowering and fruiting. Blossom end rot (a black sunken area on the bottom of the fruit) is often a symptom of too much or too little water. Blossom drop is also a common problem that occurs from lack of water. The tomato family has a lower water requirement than many vegetables and plants are often over-watered in the typical home garden. 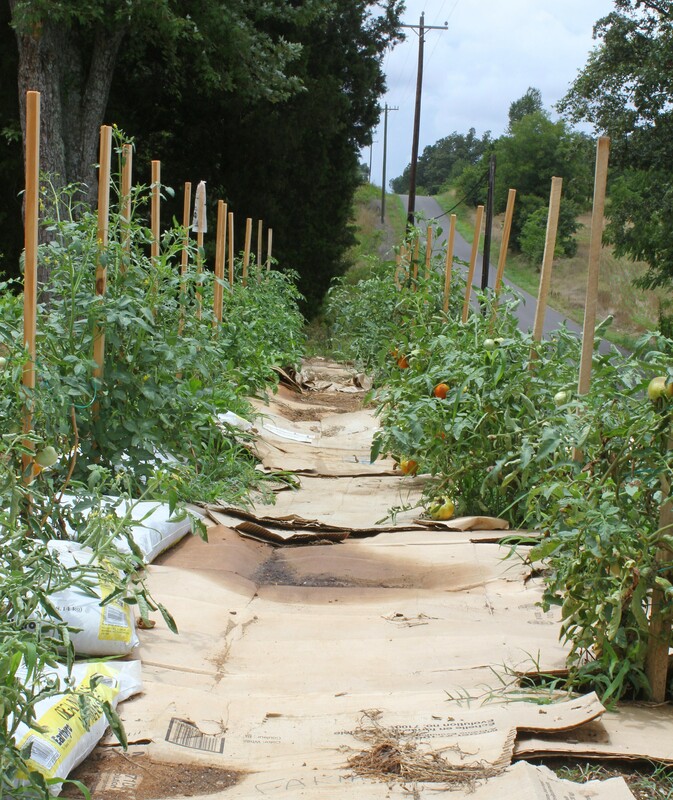 Water your tomatoes very deeply; tomato roots can be as long as five feet or more. Vine crops: cucumbers, summer and winter squash, and assorted melons need water most critically during flowering and fruiting. 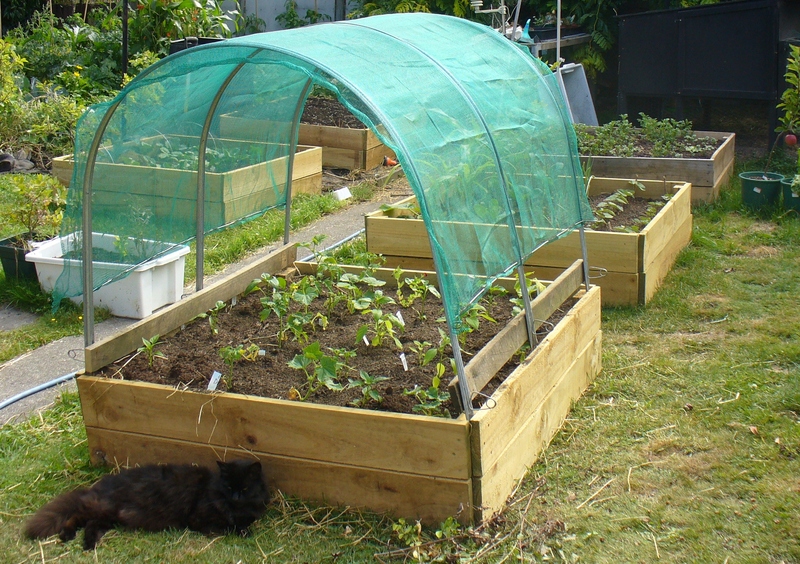 Vine crops use less water than many vegetables and are often over-watered in the typical home garden. Watering wisely has always been a mantra at MCGA and more water wise garden solutions have been implemented throughout MCGA more than ever before. Hooray! The #1 way to increase your soil’s water holding capacity is to amend your garden soil with coarse, decomposed organic matter such as compost, leaf mold, manures, straw and more. In our clay soil, organic matter glues the tiny soil particles together into larger particles, increasing pore space. This process takes place over time. This increases soil oxygen levels and improves soil drainage, which in turn increases the rooting depth allowing roots to reach a larger supply of water and nutrients. Another method to add organic matter is to replant the fall garden with a green manure crop such as winter rye or buckwheat. I use mulches and drip irrigation to conserve water as well and to keep moisture off the foliage to avoid air borne fungal diseases. Mulches, mulches and more mulch. Plant in blocks, rather than rows. This creates shade for roots and reduces evaporation. Shade cloth is helpful too. 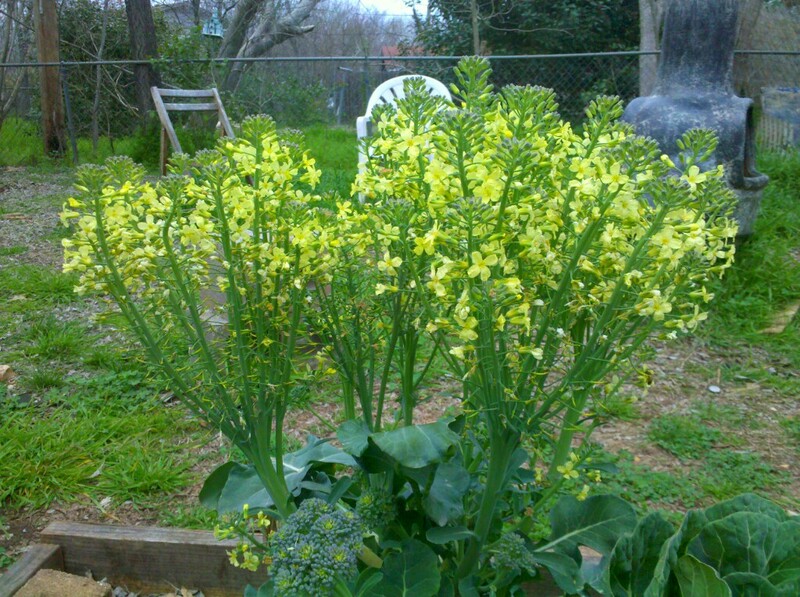 Control weeds that compete with vegetables for water. Group plants with similar water needs in the same section of the garden for easy irrigation. 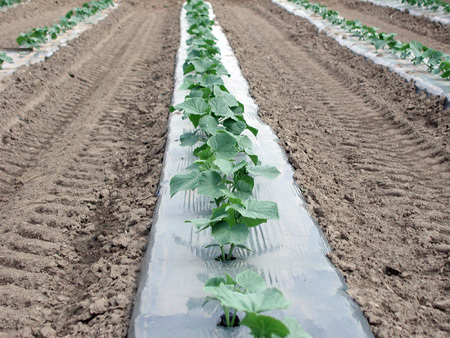 Cucumber, zucchinis, and squash, for example, require similar water applications. Stay cool and let us know what techniques worked for you!